So, we set out on a another week of Springtime! On Saturday the course had dried out enough for all to take part in the Captains Drive In. It was a thoroughly enjoyable day with excellent grub after and a fair amount of banter! Everyone put a tee in the ground where they thought the Captains Drives would land....how wrong most of them were! Should have known better than to put them in the fairway! 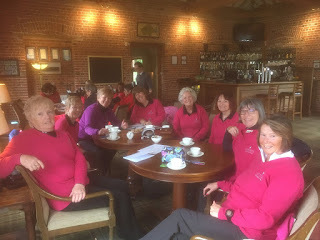 It was not a great day for playing matches and as the greens flooded at Chesfield in the afternoon, Virginia and yours truly took on Aldwickbury Park in a scratch foursomes match in the Powell Cup. Unfortunately we were soundly beaten....but there’s always next year! The rest of the week was not that good for golfing either, the course being completely closed on Tuesday and then, fog on Thursday coupled with the earlier waterlogging lead to the cancellation of the April midweek Stableford! However at the end of another miserable week the weather fairies tell me that next week really will be better. We have the rearranged Australian Spoons on Tuesday and the Jubilee Jug on Thursday so get your shorts and your fake tan out! Don’t forget there will be a raffle on Thursday for the Air Ambulance so please bring an extra £1 or 2 with you. Please pay in the usual way for the event - £12 to include afternoon tea.